The barefooters’ friend, Dr. Lieberman of Harvard, is part of a team with a new study out on minimalist shoe running. The study shows that running in minimalist shoes (and by implication running barefoot) really does strengthen the foot muscles. The study is The effect of minimal shoes on arch structure and intrinsic foot muscle strength. You can go there and grab a copy yourself (it is open access). It’s been accepted for publication, but not yet published. Here are the result from the abstract. Results: Analysis of anatomical cross-sectional areas and muscle volumes indicate that the flexor digitorum brevis muscle became larger in both groups by 11% and 21%, respectively, but only the minimally shod runners had significant areal and volumetric increases of the abductor digiti minimi of 18% and 22%, respectively, and significantly increased longitudinal arch stiffness (60%). They used an interesting technique to figure out muscle “strength” in the feet. If you think about it, how would you do that? In this case, they used MRI to measure the sizes of the different foot muscles. Neat. So what they did was recruit some runners and have half of them transition over a 12-week period to minimalist shoes. They used the MRI to look at the muscle sizes at the beginning and at the end of the study (they also did other measurements that I will also discuss). Then they compared them. Again, they found that the minimalist shoes increased that muscle mass compared to what happened with a control group. They looked at three muscles on the bottom of the foot. 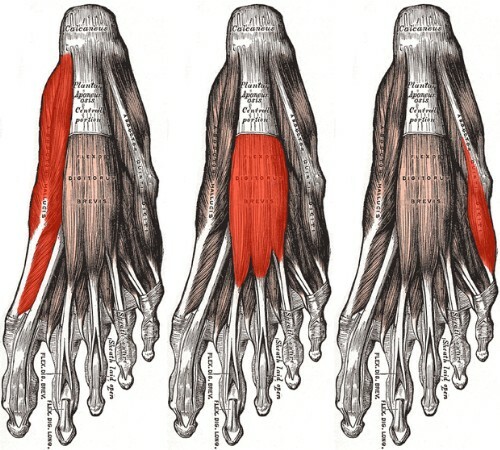 That image is a composite I put together of three Wikipedia images, of (left to right) the abductor hallucis (muscle for the big toe), the flexor digitorum brevis (shorter muscle for the toes), and the abductor digiti minimi (muscle for the little toe). For the control group, they were to use their normal running shoes (more-or-less—they had to meet certain criteria). For the test group, they had a choice of two different minimalist shoes, the New Balance Road Minimus 10 or the Merrell Pace-Trail Glove. Note tha these two shoes are different in that the New Balance has a heel (!) of 4mm while the Merrell is zero-drop. I have no idea why the researchers allowed that sort of confounding difference. There is a criticism of the study, here, from the Running Research Junkie, so go read that if you wish. I tend to agree, in that I found the study hard to read and figure out what was going on, and the data was presented in a way that really seemed to obscure what was going on. So, here are a few thoughts on various pieces of the write-up that somehow caught my eye or gave me pause. They were very careful in transitioning the runners to minimalist shoes. For instance, early on they had the minimalist runners alternate between jogging and walking. Later, for a day’s workout, they did about half of it in regular shoes and half of it in the minimalist shoes. Even by the end of the study period they were still only running about 60% of their miles in minimalist shoes. But that still made a difference. One of their findings was that the middle muscles increased in both groups. For the life of me I cannot figure out how that happened. According to one chart, these were regular runners who were doing about 50 km a week before the study. But then during the study, following the study protocol, they did about 40 km a week. So how would that have increased any sort of muscle mass anywhere in the control group? They don’t say. They also show large error bars on the mileage during the study. For instance, with the test group, the mileage was given as 41.3 ± 13.8. If you are doing a study, doesn’t that say that nobody was following your protocol very well at all? One of the major things the study looked at was whether switching to minimalist shoes caused the subjects to switch to a more forefoot landing. That was the case. For the control group, the average strike angle stayed close to 11°. For the test group, it went from about 9° to about 3°. But look at the error bars for the test group: -2.7 ± 7.6. Basically, some of the runners changed, and some didn’t (yet all that data was generally presented as a mass, and not with that separated out). There was some discussion, though, that those with the 4mm heels were less likely to switch to a forefoot landing (duh). Also, those with the 4mm heels seemed to get less benefit of increased foot musculature. There were only 33 subject (divided between the two groups). You can criticize them for such low numbers, but this is one reason there are so few studies. It’s hard to get enough people to participate. They also had 4 people who had to withdraw during the study. That’s actual rather interesting. One minimalist runner had to drop out for reasons unrelated to running. However, the three regular shoe runners who had to drop out did so because of 1) Achilles tendonitis; 2) a plantar fascia tear; and 3) lower back pain. Obviously, the statistics are lousy so you cannot draw a decent conclusion from that, but I really want to! The study also looked at the stiffness of the arch. This is done by making measurements of various foot lengths while sitting (non-load bearing) and while standing (load-bearing). The study reported that stiffness (meaning strength, and ability for the windlass mechanism to work. This increased by 60% in the minimalist shoe runners. There was also, again, significant correlation with whether those runners switched to a more forefoot landing. This is not surprising since forefoot landings really activate the windlass mechanism (and the arch support in regular running shoes in many ways inhibits that mechanism). Let me finish this with the final concluding paragraph from the study. To conclude, these findings support earlier studies, which suggested that running barefoot or in minimal shoes increases the overall area and volume of the plantar intrinsic musculature, makes greater use of the springlike function of the longitudinal arch and its associated muscles, and promotes stiffer arches. These results suggest that runners can adapt successfully to using minimal shoes without increased risk of injury if they do so gradually and carefully, but future studies with larger samples sizes are clearly necessary to test this hypothesis more carefully. So did the subjects get to keep the shoes? the conclusion speaks about barefoot running when the study never observes barefoot runners. hmmm…. I think it is probably because a 4mm (< 0.16") heel drop is close enough to zero. Fig 6 of William A. Rossi's "Why Shoes Make “Normal” Gait Impossible" shows that the weight distribution of a barefoot as 50% across the Metatarsal Heads and 50% on the Calcaneous. Yet for a 3" (~76mm) heel (presumably female) the weight distribution becomes 90% across the metatarsal heads and 10% on the Calcaneous. You can use Linear Interpolation to get the intermediate weight distributions. For a 4mm heel drop the weight distribution of a barefoot is ~52% across the Metatarsal Heads and 48% on the Calcaneous. For an average male foot (longer than a female's) the percentages would be even closer to the zero drop (equal 50/50) distribution.